Gene Activity in Early Development reviews the state of knowledge regarding genomic function in the programming and operation of what Bonnet, in 1762, described as "the miracle of epigenesis." The book is divided into four sections. 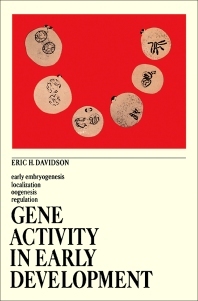 Section I is concerned with gene activity in early embryogenesis, with the time of onset and the nature of embryo genome control, and with recent attempts to analyze the shifting patterns of gene expression as development proceeds. Section II reviews various classic and recent studies relevant to the phenomenon of cytoplasmic localization of morphogenetic potential and discusses the significance, from a contemporary vantage point, of this often neglected area of developmental biology. Section III deals with genomic function in oogenesis, beginning with a general survey of what could be described loosely as the natural history of the oocyte nucleus, and proceeding to current attempts to understand the character and the ultimate function of the oocyte gene products. Section IV discusses various aspects of the general problem of gene regulation in animal cells.